Now that we know the physical factors that influence the rates of diffusion of respiratory gases between an animal and its environment, let's take a look at some of the adaptations animals have evolved for maximizing their respiratory gas exchange. They include adaptations for increasing the surface area over which diffusion of gases can occur, maximizing partial pressure gradients, and minimizing the diffusion path length through an aqueous medium. consist of thin, delicate tissues, they minimize the length of the path (L) traversed by diffusing molecules of O2 and CO2. Because external gills are vulnerable to damage and are tempting morsels for carnivorous organisms, protective body cavities for gills have evolved. Many mollusks, arthropods, and fish have internal gills in such cavities (Figure 48.3b). Air-breathing vertebrates also have large surface areas for gas exchange. Lungs are internal cavities for respiratory gas exchange with air. Their structure is quite different from that of gills (Figure 48.3c). Lungs have a large surface area because they are highly divided, and they are elastic so that they can be inflated and deflated with air. 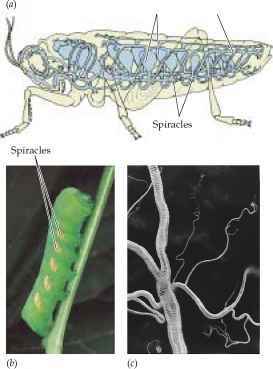 The most abundant air-breathing invertebrates are insects, which have a respiratory gas exchange system consisting of a highly branched network of air-filled tubes called tracheae that branch through all tissues of the insect's body (Figure 48.3d). The terminal branches of these tubes are so numerous that they have an enormous surface area. ► Very thin tissues in gills and lungs reduce the diffusion path length (L). ► Breathing actions move the respiratory medium past the environmental side of the exchange surfaces. This process, called ventilation, supplies the exchange surfaces with fresh respiratory medium that has maximum O2 and minimum CO2 concentrations. ► Circulatory systems transport respiratory gases to and from the internal side of the exchange surfaces. This process, called perfusion, helps maintain the lowest possible 02 concentration and the highest possible C02 concentration on the inside of the exchange surfaces. 48.3 Gas Exchange Systems Large surface areas (blue in these diagrams) for the diffusion of respiratory gases are common features of animals. Both external (a) and internal (b) gills are adaptations for gas exchange with water. Lungs (c) and tracheae (d) are organs for gas exchange with air. (a) In insects, respiratory gases diffuse through a system of air tubes (tracheae) that open to the external environment through holes called spiracles. (b) The spiricles of a sphinx moth larva run down its sides and are visually obvious. (c) A scanning electron micrograph shows an insect trachea dividing into smaller tracheoles and still finer air capillaries. gas exchange systems. First we'll look at the gas exchange system of insects. Then we'll describe two remarkably efficient systems: fish gills and bird lungs. Finally, we'll discuss human lungs. insect tracheae. Respiratory gases can diffuse through air most of the way to and from every cell of an insect's body. This diffusion is achieved through a system of air tubes, or tracheae, that communicate with the outside environment through gated openings called spiracles in the sides of the abdomen (Figure 48.4a,b). The spiracles can open to allow gas exchange, and then close to decrease water loss. The tracheae branch into even finer tubes, or tracheoles, until they end in tiny air capillaries (Figure 48.4c). In the insect's flight muscles and other highly active tissues, no mitochondrion is more than a few micrometers away from an air capillary. Each filament is folded into many thin, flat gas exchange surfaces called lamellae. Water enters, O2 is high. 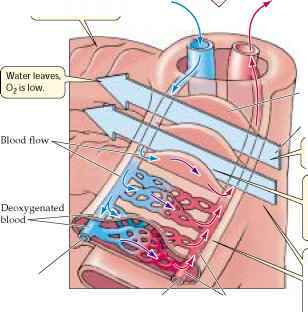 O2 diffuses from water into the blood over the entire length of a lamella. Blood flow through the lamellae is countercurrent to the flow of water over the lamellae. 48.5 Fish Gills (a) Water flows unidirectionally over the gills of a fish. (b) Gill filaments have a large surface area and thin tissues. (c) Blood flows through the lamellae in the direction opposite (left to right, in this depiction) to the flow of water (right to left) over the lamellae. with the Po2 in the bubble. When the insect dives, the air bubble contains about 80 percent nitrogen and 20 percent O2. As the insect consumes the O2 in its bubble, the bubble shrinks a little. The bubble doesn't disappear, however, because it consists mostly of nitrogen, which the insect does not consume. rounding water, O2 diffuses from the water into the bubble. The bubble acts as an auxiliary lung, and for these small animals, the rate of O2 diffusion into the bubble is enough to meet their O2 demand while they are under water. fish gills. The internal gills of fish are supported by gill arches that lie between the mouth cavity and the protective opercular flaps on the sides of the fish just behind the eyes (Figure 48.5a). Water flows unidirectionally into the fish's mouth, over the gills, and out from under the opercular flaps, so that the gills are continuously bathed with fresh water. This constant, one-way flow of water moving over the gills maximizes the Po2 on the external surfaces. On the internal side, the circulation of blood minimizes the Po2 by sweeping the O2 away as rapidly as it diffuses across. The gills have an enormous surface area for gas exchange because they are so highly divided. Each gill consists of hundreds of leaf-shaped gill filaments (Figure 48.5b). The upper and lower flat surfaces of each gill filament are covered with rows of evenly spaced folds, or lamellae. The lamellae are the actual gas exchange surfaces. Their delicate structure minimizes the path length (L) for diffusion of gases between blood and water. The surfaces of the lamellae consist of highly flattened epithelial cells, so the water and the fish's red blood cells are separated by little more than 1 or 2 |m. The flow of blood perfusing the inner surfaces of the lamellae, like the flow of water over the gills, is unidirectional. Afferent blood vessels bring blood to the gills, while efferent blood vessels take blood away from the gills (Figure 48.5c). Blood flows through the lamellae in the direction opposite to the flow of water over the lamellae. This countercurrent flow optimizes the Po2 gradient between water and blood, making gas exchange more efficient than it would be in a system using concurrent (parallel) flow (Figure 48.6). Some fish, including anchovies, tuna, and certain species of sharks, ventilate their gills by swimming almost constantly with their mouths open. Most fish, however, ventilate their gills by means of a two-pump mechanism. The closing and contracting of the mouth cavity pushes water over the gills, and the expansion of the opercular cavity prior to opening of the opercular flaps pulls water over the gills. These adaptations allow fish to extract an adequate supply of O2 from meager environmental sources by maximizing the surface area (A) for diffusion, minimizing the path length (L) for diffusion, and maximizing the Po2 gradient by means of constant, unidirectional, countercurrent flow of blood and water over the opposite sides of their gas exchange surfaces. bird lungs. As we saw at the beginning of this chapter, birds can sustain extremely high levels of activity much longer than mammals can—even at very high altitudes, where mammals cannot even survive. Yet the lungs of a bird are smaller than the lungs of a similar-sized mammal. How can this be? Another unusual feature of bird lungs is that they expand and contract less during a breathing cycle than mammalian lungs do. To make things even more puzzling, bird lungs contract during inhalation and expand during exhalation! How insect tracheal system maximise the efficiency of gaseous exchange? Are highly branched folds of the body surface that maximise gas exchange? What is the process of moving the respiratory medium past the sites of gas exchange? What are some adaptations that increase surface area in animal system? What are all the adaptations that increase surface area in animal systems? Why are fish gills continually bathed in fresh water? Do any fish use concurrent flow? How to maximize gas exchange? Why the gas exchange system of insects and mammals are similar? How does insects moves gases over the gas exchange surface>? What structures provide a large surface area for gas exchange in frogs? 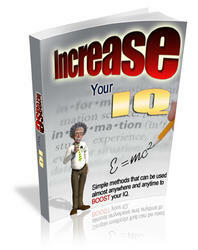 What minimizes the diffusion distance for o2 and co2? How do exchange gases fish? Why do gill membranes have large surface area? What is the flow of water through a fish? How do the respiratory surfaces adaptions make for efficient gas exchange? What specialized adaptations do fish have for maximize gas exhange? What are some adaptations that help increase gas diffusion in animals? How insect highly developed gases exchange? What are the three adaptations that enhance the function of a respiratory surface? Are highly branched folds of the body surface that maximize gas exchange? Do any fish have tracheae? How Do Respiratory Adaptations Minimize Diffusion Distances? Which of the following is not an adaptation for gas exchange? What adaptations do fish have to allow this exchange? How do lamallae minimize the diffusion length in fish? What adaptations do fish have to enhance gas exchange? Which of the following is not an adaptation for respiratory gas exchange? What adaptations do lungs have to maximise diffusion? What is the adaptation of the following gaseous exachange surface Gills? What is the adaption of gas exchange on the body surface? What are adaptation of gills in acting as gaseous exchange? What would speed up the rate of gaseous exchange in insects? What are the adaptive features of respiratory surface? How respiratory surface adapt to its function? What is adaptation for respiratory media in animal? Why are lungs and gills highly folded? How are the gills adapted to gaseous exchange? How are the lungs and gill structures adapted to their function? How is the respiratory surface in fish adapted to its functions? Why are lungs and gills highly foilded? WHO DOES A MOSQUITO LARVAE USE FOR GASEOUS EXCHANGE? Which respiratory surfaces are adapted for gaseous exchange? How are respiratory surface in mammals adapted to their functions? How the different characteristics of respiratory surface? How are respiratory surface in mammals adapted to their function? How are gases transported in insect bodies? 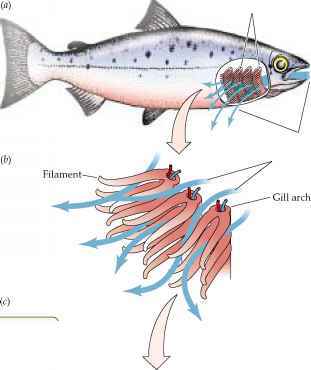 How the gill filaments are adapted to their function? How respiratory surfaces in animals adapted to functions? What adaptation are found in the surface during respiration for gases exchange? What makes respiratory adapt to its function? How can air sacs adapt to respiration? How the tracheal system is adapted to its funsion? Why is the gaseous exchange surfaces very thin? How is the respiratory surface in man adapted to carry out its function? What are the adaptative features of gills for respiration? Why do mammals use gaseous respiration and not aqueous respiration? How respiratory surface is adopted to their function? How are gills adapted to breathing? How are the respiratory surfaces in animals adapted to their function? 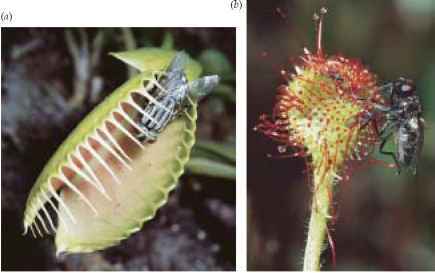 How an insect is suited for gaseous exchange? How are gaseos exchange surface of a frog adapted on the function?